As many of you know, I love books and I love to read. Since I'm trying to save a bit of money, my book spending has gone down in recent years vastly. Prior to marriage, I probably dropped hundreds of dollars on books each month. My library was full to packed, and I had multiple bookshelves which were double stacked with books. I had books piled on books in front of other books. When I moved in with Paul, he kindly got my to realize this was stupidity. There was no need for this great amount of books, most of which went unloved. I had a library card and I could buy books that I really wanted. We only have one bookshelf and most of it is packed with my books, again stacked on each other in front of other books stacked on each other. I have some books in the attic as well, and many other books are still at my mom's house, but now, every time I decide to keep a new book, I must decide to get rid of another. I've virtually rid myself of manga, silly romances, and less than awesome fantasy novels. When I started to use the library, I found they had a new option that I had never known of -- reserving and holding books at the library using the internet. It's like Amazon, but for free, and you have pick up and return the books. I used it liberally those first years, but then, I got delayed on sending some books back, and then I got pregnant, and then I had Nathan, and then I owed roughly one hundred and fifty dollars to the library. Taking action, I decided to call them. They told me if I returned all the books I had out for years, I would be down to owing fifty dollars. I "promptly" returned all my overdue books. I then let that fifty dollar fine sit and sit, and it hurt. I wanted to get books out of the library, but I couldn't, and I was visiting the damnable library all the time for Nathan's story times. This week, I broke down and decided to pay them some of my fine with cash I had been carrying for three weeks and not using. After paying, I asked the librarian helping me if I could get books out or if the fine was too much. They said, "Go ahead and get some books!" That's all you needed to tell me. I came home and promptly reserved five books, a few related to crafting and a few fiction. Let me tell you, modern crafting books are apparently a hot commodity in the library world. I am five out of five people waiting to borrow Sew What! Skirts . I got my first reserved book today, and I am thrilled with it. It's reminiscent of Battle Royale , but without the slight strangeness that Battle Royale brings by being a product of Japan. The Hunger Games by Suzanne Collins is a young adult story of a girl battling for her life in an arena where there can be only one victor in a fight to the death between twenty four teenagers. I ripped through the book in less than two hours, so it's a very quick read, but it is one I can suggest for people who like young adult stories or who like fantasy stories about people being forced to battle for their lives in a game. For those of you who care, I mostly liked the main character, a girl who volunteers for the game to prevent her younger sister from being taken to play in it. She's deadly and focused and while romance between herself and another of the players is a theme of the story, she has the sense to realize that romance is stupid until it can benefit her, and even then the romance is another of her tools in the game. Anyway, check out the book. If you're curious, this whole post is a byproduct of not having any significant crafting to share with you. I am now nearly halfway done with my scarf. I flipped out this week and started to knit like the wind on it. I followed through with my knit at least three rounds a day promise to myself and it has made a difference. I can't show you any sewing because for the last week or so, my sewing area has had no light. Our switch broke and poor injured Paul has just repaired it today. Pictures of my crafting soon. I promise. 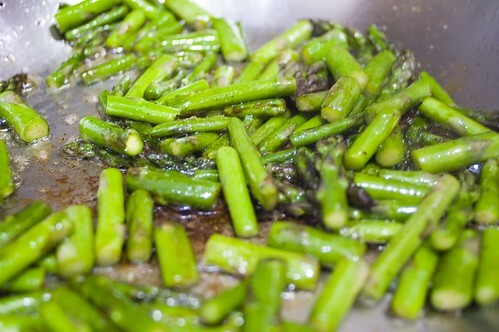 Until then, go browse some food sites or something and make some delicious asparagus dishes.